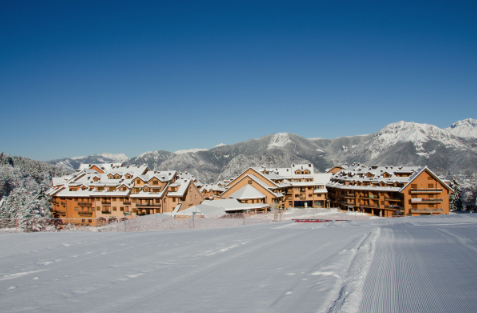 Interval International has announced the affiliation of 21 timeshare units at Residence La Splaza, a seasonal ski and summer resort in the Italian Alps. The new units are located in Scala N, part of the well-established development in the popular Montecampione ski resort near Boario and Lake Iseo in Valcamonica, one of the largest valleys in the eastern Lombardy region of Italy. Located at an altitude of 1200 metres or nearly 4,000 feet, the destination is renowned for its downhill and freestyle skiing and snowboarding from mid-December to the beginning of April. During the summer season, hiking, tennis, and golf are popular activities. The complex features a number of on-site and nearby facilities that are available depending on the season: ice skating rink, pool, gym, playground, soccer pitch and basketball, as well as tennis and volleyball courts. Guests also have access to restaurants and bars, a market, pharmacy and shops, and an intra-resort minibus service. The units that are part of Interval’s network include studios and one- and two-bedrooms and are housed in a new building adjacent to the main ski lift. Each has a kitchen and balcony. Residence La Splaza is 62 kilometres (38 miles) from the nearest international airport in Bergamo and 110 kilometres (68 miles) from Milan.